Here's a weird fact about me: I love menu planning and making grocery lists. It's something I do weekly, and there's something about looking through recipes, checking grocery store ads, and making a plan for the week's dinners that I find really satisfying. I use a variety of resources to come up with meals for the week. I have a "What's for Dinner?" Pinterest board and I try to make a note of the recipes I try and what we think, so I use that often. I also have some cookbooks and a recipe binder with some tried and true favorites. Additionally, there are a few blogs I enjoy reading that share weekly meal plans (Pass the Sushi, Mix and Match Mama, and Skinnytaste) so I sometimes go there first for inspiration, although I never follow their plans exactly. As you know, budgeting has been my life lately, and we've especially been trying to cut spending on food. We're eating at home more, which means I have to work extra hard to keep our grocery bill low. Typically, I plan 4-5 dinners a week and have two nights where we eat whatever we can find at home or pick something up if we have the money. We usually have leftovers for lunch, and something quick and easy (bars/cereal) for breakfast during the week. When I have time on the weekends, I love to bake something sweet to enjoy all week, and sometimes I'll try to make a homemade breakfast on Sunday mornings before church too. It's a lot of cooking and meal prep, but it works for me because I enjoy it. Is menu planning something you enjoy? How about cooking? 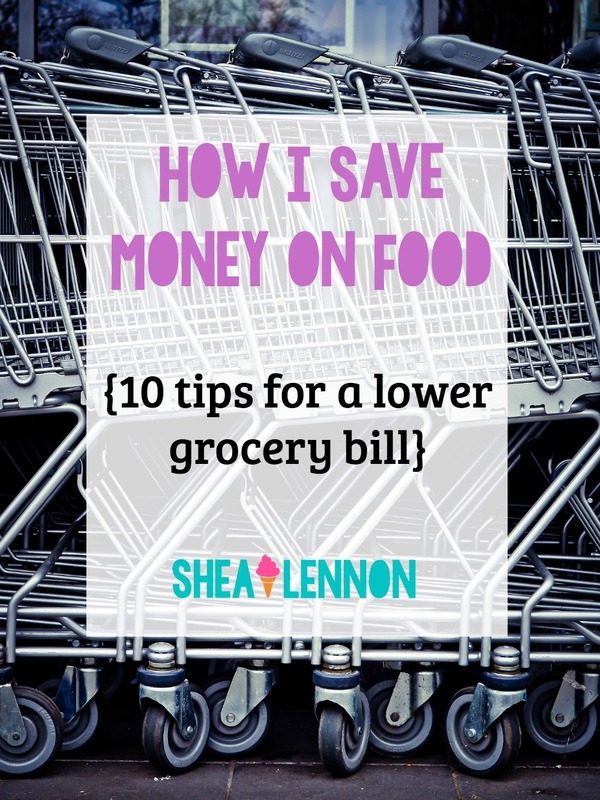 Here are a few ways I keep my grocery bill low. 1. Shop at Aldi FIRST. I've mentioned before that I've recently become an Aldi convert. When we do our weekly shopping that's always my first stop. I try to get as much as I can there before going to another store. I usually end up having to make a second stop, but it's a small and quick one. 2. Check weekly ad before I make the list. When I'm planning my meals, I like to know what's on sale. I try to incorporate meat, produce, and other items that are on sale into my menu. 3. Assess what we already have before I make the list. I used to be bad about this, but now I like to do a quick check of our freezer, fridge, and pantry before I make a list. I often have meat in the freezer that I can thaw, or leftover (dry) pasta from another dish that I can cook. 4. Plan meals and grocery shop once a week. For us, this is essential. I know this doesn't work for everyone, but it really saves us money by planning out all of our meals and buying everything at once. If we have meals planned, we are less likely to be tempted to pick something up. 5. Buy on sale and freeze. I especially do this for meat, which I rarely buy full price. Instead, I wait for things like ground beef and chicken breasts to go on sale, and then buy extra to keep in our freezer. We have a deep freeze (that we found used on Craig's List, great deal!) that is very handy for this purpose. 6. Know base prices for items so you know if a sale is actually a good deal. You don't have to have exact numbers memorized, but if you know in general what you spend on certain items, you'll know whether it's worth picking up something that's marked down but not on your list. Sometimes stores will trick you with a sale sign but it's only marked down by a few cents. If it's not something I need I'll wait for a better markdown. 7. Shop from your list, but be flexible. I try not to make very many purchases that aren't on my list (so I don't go to the store hungry or that derails quickly!). However, I also often make swaps once I'm at the store. For example, I may have strawberries on my list, but if they don't look good that week I'll buy another fruit. Also, if I have a specialty ingredient (an Asian sauce or spice for example) on my list, I might skip it and substitute with something I already have if it's too expensive. 8. Try to stick to sale/low cost items, but allow 1-2 splurge items/week. Buying everything on the cheap can get boring, especially for someone who loves to eat as much as I do. So if I can keep the cost of everything else low, I make room for a couple of "splurge" items, like ice cream, good chocolate, or specialty cheese. 9. Think beyond dinners. When I'm planning our meals, I try to think about what we have going on that week and whether we'll need leftovers to have for lunch, etc. If I make something like a pasta casserole, I'll go ahead and make the full recipe that serves 6-8 and freeze half for an easy dinner later. I love having a stash of easy freezer meals! 10. Use cash. Again, this is something that works for me that may not work for you, but I have found that it makes a difference. I find that when I use a debit card I don't pay close attention to how much I'm spending, but when I only have a certain amount of cash to spend I'm a lot more careful. It can be difficult to stay on budget at the grocery store, but I try to make it fun and challenge myself to save as much as I can each week, while still making healthy choices for my family. I would love to hear how you save money on groceries. Do you have any tips I should add to my list? Linking with A Beautiful Melange.